Waking up and opening the window to a beautiful morning in the grand city of Seoul injected me with so much energy! Mass was at 9:00 a.m. in Myeongdong, so we grabbed a taxi that took us across the river. The cathedral was erected above a hill, in true Catholic grandeur fashion, so we had to climb some steps to get to it. The sun washed over us and taunted our patience. 9 in the morning, and it was already unbearably hot. Oh, Korea in August! Inside the church was a lively congregation and cool relief! Classic Gothic-styled ogival arches contrasted by flat screen TVs again implied the harmony of classic and modern Korea. Foreigners and Koreans came together in an amalgamation of spiritual worship – a beautiful vision indeed! After mass, we made an impromptu trip to the nearby Myeongdong Market. There, I would find the coveted Krispy Kreme. Perhaps we missed the fresh batch, so my donuts were cold and unimpressive. However, finding H&M made everything instantly better! Along the market were also stands selling everything from Armani boxers to Louis Vuitton bags – all imitation of course. A bus ride away is the imperial grounds of Gyeongbokgung Palace. Japanese invasions and the Korean War has demolished much of the palace, but buildings were reconstructed continually. The palace is still a resplendent site and covers a large portion of land. This meant A LOT of walking for us. Clint finds ancient structures very fascinating and always hopes of finding secret passageways and hidden treasures, so this was his playground! He investigated every old lock and every covered well. We oohed and ahhed at the throne hall and schemed of taking the grand tapestry to make it our own. After an hour of walking, that seemed like a torturous eternity, we sought refuge in the National Folk Museum of Korea. The cafe offered fresh frozen orange juice and soft-serve ice cream. Even in my unspoiled childhood I had never tasted anything better! Re-energized, we surveyed the museum with the minds of scholars and curiosity of a child. Exhibits of ancient artifacts and models captivated our interest for a good while, until the rumbling of our stomachs captivated it even more. Time for lunch! Right by our hotel is a 24-hour Korean fast food joint. We got ramyun, spicy seafood udon, and seafood fried rice to satiate our enormous appetite. The sun can drain so much out of you! We took the longest nap in the history of naps subsequently and only woke up when hunger called us once again. The staff at Teppen are quite the energetic bunch! As soon as you take your seats, the chef makes an announcement, prompting the entire restaurant staff to yell simultaneously, “welcome to Teppen!” Or something to that effect in Korean. The menu is entirely in Korean, but we’re adaptable. As always, fate has a sneaky way of aligning things in this universe: the girl next to us had a working knowledge of English, enough to convey to the chef we wanted steak and shrimp and fried rice. After a cooking performance and some entertaining magic tricks, the chef presented us with three beautiful dishes. Everything was cooked to perfection. The fried rice was wrapped in a cocooned layer of fried eggs – very creative. The chef asked us what occasion brought us to Teppen, in broken English. We told him we’d been together for an entire year. He once again announced this to the entire restaurant. Everyone yelled again in unison and the restaurant cheered. It seemed excessive, but was so much fun at the same time. We dined gleefully. What a treat after a day in the sun! We left extremely pleased, but not before the crew thanked us Teppen style. 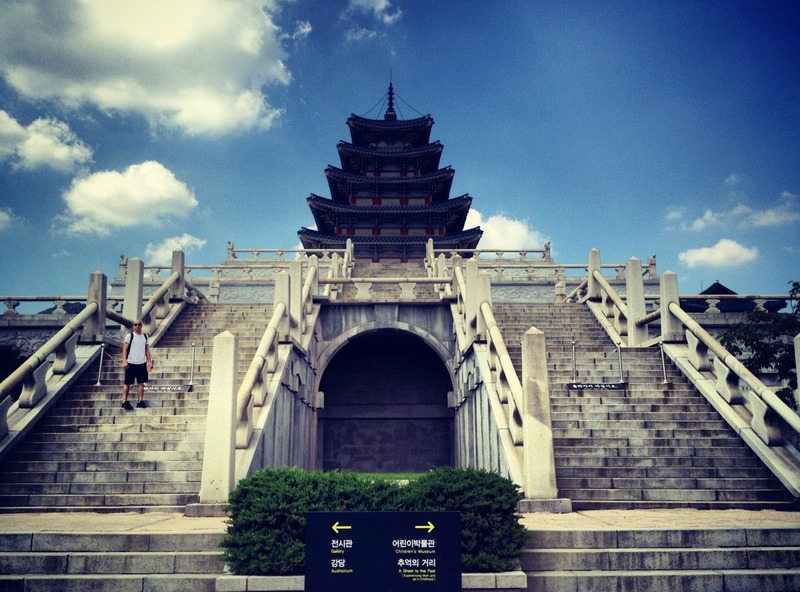 We walked around the city to get a feel for the life coursing through the veins of Seoul. People say other areas, such as Itaewon, are better for partying and dining, and perhaps this is true. But what we saw in Gangnam delighted us more than any club or bar could. Buildings showed a different face than they do in the day time. Restaurants, shops and stands looked livelier and more inviting. Couples walked the streets, holding hands. Businessmen and women hurried to catch their subways and buses. Although we were in a foreign land, everything just felt right at home. Our last day in Seoul was a short one. We slept in, considering check-out time was 12. Got some breakfast at Pho Saigon, then looked for shoes at the COEX. We left for home shortly after. Overall, a wonderful trip for discovery! We can’t wait to go back, and perhaps bring more friends next time. Click here to return to Day 1.